Getting your vehicle repaired is already stressful enough. You need your car fully operational and back on the road as soon as possible. Bring your vehicle to Coopers Auto Repair Specialists in Tacoma, WA, and remove all worries about the quality of repairs you’re receiving. You should never have to sacrifice your confidence in the auto services. 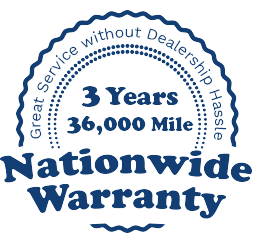 Coopers Auto Repair Specialists makes sure you keep your confidence in our quality service with our exceptional 3 year / 36,000 mile nationwide warranty program. As a NAPA Autocare Center, our warranty covers you nationwide. No matter where you find yourself needing auto repair services, a NAPA Auto Care Center is sure to be nearby. There are more than 14,000 locations across the country that will honor your warranty. At Cooper’s Auto Repair Specialists, we make auto repair a stress-free experience. To match our team of the industry’s best auto service experts, we offer an industry-leading warranty program–3 times the dealership warranty on parts and labor. You’ll never have to worry about your repairs before, during, or long after you’ve received our top quality services. Our NAPA Autocare Peace of Mind Warranty makes sure you’re taken care of wherever you go. This limited warranty is extended only to you, the original purchaser, and not to anyone who may purchase your vehicle during the term of the warranty. This limited warranty is made by Coopers Auto Repair Specialists. This warranty will be honored by Coopers Auto Repair Specialists locally, or by any pre-authorized NAPA AutoCare Center repair facility anywhere in the United States. In the event of needing out-of-state or out-of-town warranty repairs, Coopers Auto Repair Specialists must be contacted during business hours and pre-authorization must be obtained BEFORE any diagnostic testing or repairs are performed, or any cost, related to the original repairs covered under this warranty is incurred. If warranty repairs are needed after business hours, NAPA AutoCare Nationwide Warranty Center must be contacted and pre-authorization must be obtained BEFORE any diagnostic testing or repairs are performed, or any cost, related to the original repairs covered under this warranty is incurred. Electronic engine management system and other on-board computer system,(engine, body, brake and suspension computers), Cruise control systems. Steering/ suspension systems, wheel bearings, CV joints/U-joints, half-shafts and drive shafts. Clutches – clutch component or assembly repair and replacement. Other minor repairs and services. Drive axles, Transaxles (differential assembly and components, i.e. gears, bearings, shafts, and seals. The original purchaser must pay for any non-Coopers Auto Repair Specialists authorized repairs and/or diagnostics performed on their vehicle. This warranty will not apply to your repaired vehicle if it has been damaged by abnormal use, misuse, neglect accident, alteration or “tampering with” (by any other than Coopers Auto Repair Specialists or its employees). This warranty does not cover any costs such as loss of earnings, personal injury damages, per diem or any other associated incidental or consequential damages. This warranty does not cover any parts and/or labor that is not documented on the original invoice. Coopers Auto Repair Specialists reserves the right to warranty “wear items” such as brake pads, clutch discs, and tires as see fit. Note: All parts replaced, services and/or repairs performed on commercial vehicles carry a 12 months, 12,000 mile nationwide warranty per the conditions stated in this warranty unless otherwise noted on the invoice, or per commercial services under contract agreement with Coopers Auto Repair Specialists. Remanufactured Engines will come with independent warranty from engine supplier. Remanufactured Transmissions, Transfer cases and Differentials will come with independent warranty from supplier. Oil changes, fluid changes and flushes, wipers, filters. Contact Coopers Auto Repair Specialists service Department, Puyallup (253)466-3917 Tuesday-Saturday 7:30 to 5:30, or Tacoma (253)536-3797 Monday-Friday 7:30 to 5:30, for after-hours service contact 1-800-LET-NAPA, option 5 before any diagnostics and or repairs are performed, of any cost, related to the original repairs covered under this warranty. Any and all diagnostics and/or repairs unauthorized by Coopers Auto Repair Specialists or NAPA AutoCare Nationwide Warranty Center are void of this warranty and the original purchaser will not be compensated for the like. We recommend that you keep copy of your invoice with the vehicle at all times until the expiration date of warranty, and copies of follow-up service inspections. As a benefit to our valued customers, we offer a complimentary annual inspection of the services or repairs that are covered under your original extended warranty benefit program. For as long as you own the vehicle, during the warranty period, we ask that you bring the vehicle into us for an annual inspection (12 months or 12,000 miles) to ensure that the system that was repaired is still operating as intended and that no other conditions may be developing that would void the original warranty. Please call your service advisor to make this appointment.